On April 2, 2019 Dell EMC presented in an external webinar its powerful data protection enhancements with Dell EMC Data Protection appliances, Data Domain and Integrated Data Protection Appliances (IDPA). The announcement of these enhancements that extended to multi-cloud environments was made in February 2019. In this webinar, IDC presented its views and thoughts on the PBBA market and Dell EMC’s leadership position in this market. One of Dell EMC’s customers, GEI Consultants, Inc, expressed their experience and benefits achieved by deploying Dell EMC’s Data Protection solutions. According to IDC, 92% of organizations have adopted a cloud environment with 64% adopting a multi-cloud approach. With a mix of different clouds, protecting data while meeting compliance and security requirements is a critical challenge for many organizations. More choice for mid-size organizations with Data Domain DD3300 and IDPA. GEI Consultants, Inc., is currently using Data Domain as a target in their backup strategy. Before they implemented Data Domain from Dell EMC, they were seeing backup windows upwards of 48 hours. Once they made the switch to Data Domain, their backup windows decreased to 4 hours! They are now deploying Dell EMC Cloud Disaster Recovery (DR) in their AWS environment. 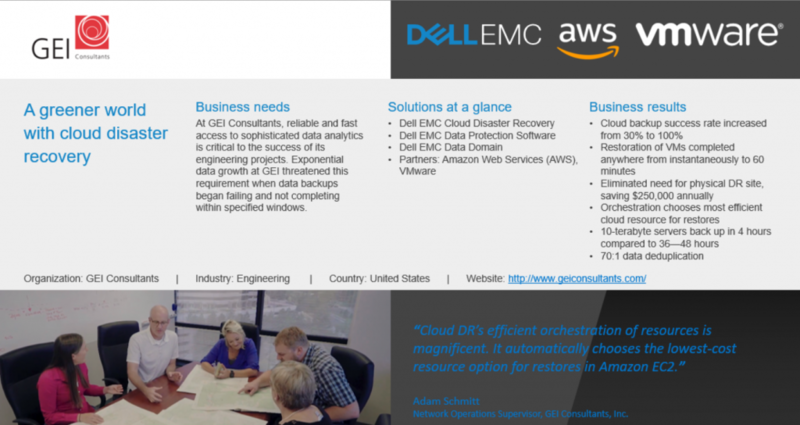 By utilizing Dell EMC Cloud DR, they eliminated the need for a physical disaster recovery site saving them $250,000 annually. “Cloud DR’s efficient orchestration of resources is magnificent. It automatically chooses the lowest-cost resource option for restores in Amazon EC2.” – Adam Schmitt – Network Operations Supervisor, GEI Consultants, Inc.
It’s okay if you missed the live webinar, you can find the recording here. Further resources that support our data protection appliance launch can be found below.